Photo source: HBarrettuk - Wikimedia Commons. Some rights reserved. The Circassians are the oldest indigenous people of Northwest Caucasus and identify themselves as Adyge. The Circassians preserve their culture and continue to use the Circassian language as their primary means of communication. Only in the 18th century did their language assume a written form. Organized into tribes, the Circassians have never had an independent state. Once, the Circassians were the main ethnic element in northwest Caucasus; however, this drastically changed under the pressure of the Russian conquest, and especially after the defeat of the Great Revolt (1825-1864), when a Circassian mass exodus took place. This exodus was called 'one of the greatest mass movements of population in modern history'. Circassians moved to Turkey and other areas of the Ottoman Empire, including the Middle East. One and a half million Circassians abandoned their ancient homeland, leaving behind scattered remnant communities. The Russian census of 1897 recorded only 150,000 Circassians, less than one tenth of the original population. There are many stories, poems and songs about the victims of the war, the emigration itself and the state of exile. Rituals and memorial days are devoted to these events. Much insight into Circassian culture and customs can be gathered from Circassian folk dances. The dances tell stories about everyday life such as courtship, preparing for war, the harvest, and showing of strength. All stories ultimately originate from the centuries-old Nart Epics, a series of 26 cycles and 700 texts dating back to 4,000-3,500 BC. The stories preserve Circassian ancient history, and they are predecessors to Greek mythology, containing ancient stories of gods from southern Russia. From these Epics came the "Adyge habza," or Circassian traditions. 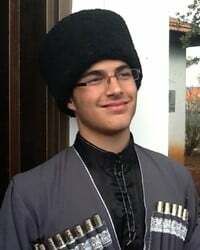 The habza is an important feature of Circassian identity and was established long before their Islamization. It is the Circassian system of laws, rules, etiquette, and ethos. The habza provided the rules of behavior and morality that are handed down in other societies through religion. The Adyge habza is passed on from generation to generation, with today's Circassian youth still being taught to carry on the traditions. The Israeli Adyghe / Circassians, although small and isolated, have succeeded in preserving their culture and identity more than any other Circassian community in the diaspora. They number about 7,000 and reside mainly in two villages. They are Sunni Muslims, and are recognized as a distinct community. The villages maintain good relations with the nearby Jewish villages and towns, as well as with neighboring Arabs. Circassian men serve in the army, so structurally their position in Israel is similar to that of the Israeli Druze. As for the conflict between Jews and Arabs, this is, in Caucasian opinion, a conflict between Semitic cousins and does not relate to them as people of the European side of the Caucasus. A comparison with Jordanian Circassians is useful, in order to stress the Israeli community's characteristics. In Jordan, more than in any other communities, the Circassians also have an important civil identity. In the Hashemite Kingdom, neither the Bedouins nor the Palestinians have adopted a civil Jordanian Hashemite identity to the degree that the Circassians have. The Circassians have been allies of the Hashemite rulers ever since these came from Hijaz to Trans-Jordan and established the Hashemite kingdom of Jordan with the support of the British. The Circassians have emerged as the most loyal group to the Hashemite rulers. Thus, the Jordanian Circassians share a duality whereby they have a sense of belonging to Jordan, and yet feel strong ties to their Caucasian identity and the Caucasus. Many Jordanian Circassians, for example, speak Arabic and hardly speak the Adyge language at all. On the other hand, the Adyge habza is still important. Many Circassians were Christianized under Georgian and Byzantine influence in the 6th century. However, under the growing influence of the Ottomans, Islam gradually replaced Christianity and became fully established in the 18th and 19th century, blending with remnants of Christian beliefs and even pre-Christian folk beliefs. It seems that religious influence upon Circassian collective identity, both in the past and in the present, has been limited and superficial. Some Circassians became Muslims only during their mass migration, on the ships taking them to the other side of the Black Sea. In recent years, Circassians in the Caucuses region underwent an intensive process of secularization. In addition to the absence of mosques, there is a strong norm of consuming alcoholic drinks. A whole set of social customs and rituals derived from the pre-Islamic Circassian culture has been revived. The situation of Israel's Circassians is different and Islam takes an eminent position in the villages, governing lifestyle and morals. There is also a small percentage of Cirassians who are believed to be Christians. The collapse of the Soviet Union has heightened Circassian national feeling both in Russia and in the diaspora. Since then, the Circassians have forged links with their brethren all over the world. The state of exile in the diaspora plays an important role in the collective identity of Circassians. A Circassian proverb says: "The one who loses his homeland loses everything". Other examples of proverbs expressing the longing for the homeland are: "Caucasus, my homeland, I will never forget you"; or, "I'd rather lose my eyes than forget you" . These and other similar statements are not only a romantic longing or nostalgia for the Caucasus homeland; they reflect the existential condition of the individual in the Circassian community. The re-migration of the Circassians to the Caucasus is a new phenomenon and is continuing. The successful absorption of new immigrants will depend upon the situation in the Caucasus. Political instability, economic hardship and rising crime rates limit the number of newcomers. Today, many Circassian communities worldwide are facing the problems of losing their language and culture. Yet compared to other migrant groups, the Circassians have a greater tendency to maintain their separate identity. View Adyghe in all countries.